I've made it no secret that I fall into a deep constitutional angst every year at Christmas. It's as sure as the tides, as predictable as the moon, as maddening as Calvin's morning mood when he's short on sleep. It's not all bad, this festivity swirling in the air. For one thing, there's the fact that I love an excuse to redecorate my living room. For another, when our Sunday school class read The 5 Love Languages eons ago, my top love language was Gifts. I love an excuse to shop for people I love. And then there's the age-old issue of Crack Bark. I don't think I need to tell you how much I love an excuse to ruin my oral hygeine for the greater good of gaining six pounds and living in elastic-waisted pants for the duration of winter (hint: winter is lonnnng in northern Indiana) because I can't-stop-won't-stop making it and shoving it in my slightly-fuller face. Aside from all that, I'm forever trying to make sense of Christmas. Like most of us, I enjoyed a childhood where I knew the "whole point" was baby Jesus, but it all sort of sifted through the cracks of everything else. It now strikes me as one of those classic, "Do what I say, not what I do" life moment. I guess I'd rather do what I can to walk a different way. With sticky teeth and tinsel in my hair. For a week or so, I had decided to skip a tree this year. There's simply no room in this inn for a tree. I tried stripping its backside of branches and shoving it into an awkward corner last year, but I'll be honest, the whole maneuver gave me the blues. I'd like to imagine myself as someone entirely different, someone who rises above the machine - whatever on earth "the machine" even is... I must have secret dreams of being a hippy. I want to take the streets and do...something. I want to be a renegade, when what I really am is ordinary. Totally normal. At least half-mixed up about most things. Geez Louise, is "ordinary" a hard pill to swallow. It's the fruitcake of defining characteristics. And yet, not a year goes by that we don't joke around about fruitcake. It never goes away! It has bonded us for life, in its own, weird way. I don't think accepting our boring humanity is any different. My name is Shannan, and I don't have stuff figured out. I'm passionate about loving my neighbor and selfish as heck. I want to give everything away then fill myself back up with more more more. And do it all over again. I'm tired and hopeful, an inspired cynic. I'm glaringly typical, but I hope you'll be my friend. Putting up our gangly, off-whack Christmas tree is one of a handful of childhood memories that instantly fills me with a distinct, can't-articulate-it feeling. It messes with my internal chemistry, changing me for just a second, not unlike catching a whiff of Brut cologne or drinking Coke from a glass bottle. Yada yada, we bought a skinnier tree at our favorite thrift store, with a coupon. It's as though the universe was just waiting for me to admit my humanity and just cave already. So here it is, in its narrow splendor. We jammed it into the only possible cranny. We brought out all of our weirdest, tackiest ornaments and of course, our catalog garland. I have never loved a Christmas tree more. Wouldn't you know it, it hasn't ruined everything. Jesus came so I didn't have to have all the answers. I'm sitting here in this tension, but he is with me in my struggling and confusion. With me to the end. That's what changes things. In other news, hey, Raye Marie, you won yourself a catalog garland! Email me your address at shannandmartin@gmail and I'll put it in the mail. Tomorrow I head to Trinity Church in Holdredge, Nebraska to speak at their women's Christmas brunch. It's kind of the 11th hour, but if you'd like to join us, call the church to RSVP! Happy Thursday afternoon, festive homies. "I'm passionate about loving my neighbor and selfish as heck. I want to give everything away then fill myself back up with more more more." To quote my kids when I say something they are already thinking, "Get out of my head!" Right there with you in the angst, praying for singleness of heart and action, whatever that looks like in the life that God has each of us living. girl, i so get the angsty-ness that this season brings. every.single.year. i liked your line, with me to the end. praise be that He not only understands but LOVES us in the midst of our -nesses. i HATE decorating for Christmas but i'm hosting a luncheon here Sunday and no one's home but me before then, so i'm finding a comrade in arms in you and will post a picture of my trees and mantle on FB upon my completion. cheer me on--here i go! Now that I am "grown up" HA I, too, have wrestled every year with Christmas time. I love it and want to run the heck away from it at the same time. I love giving gifts but hate the obligation. You said it so perfectly- I want to give it all away and then I just end up with more and more. It's a tension I sit with as well. Thankful that Jesus is there and it's not my job to have all the answers. Your ordinary self is one that I adore! You are an inspiration. Your writing brings me joy with every post. The world needs more young people like you and your husband. So this may sound fully sacrilegious to some, but I've been considering lately that perhaps we are trying too hard as an American culture to intertwine Jesus & tradition. Kind of like trying to mix church & state. It is perfectly appropriate to ponder & appreciate God coming in the flesh for the ultimate purpose of saving the world, yet it just gets weird when we try to connect all our fa la la la la-ing to Christ's birth. 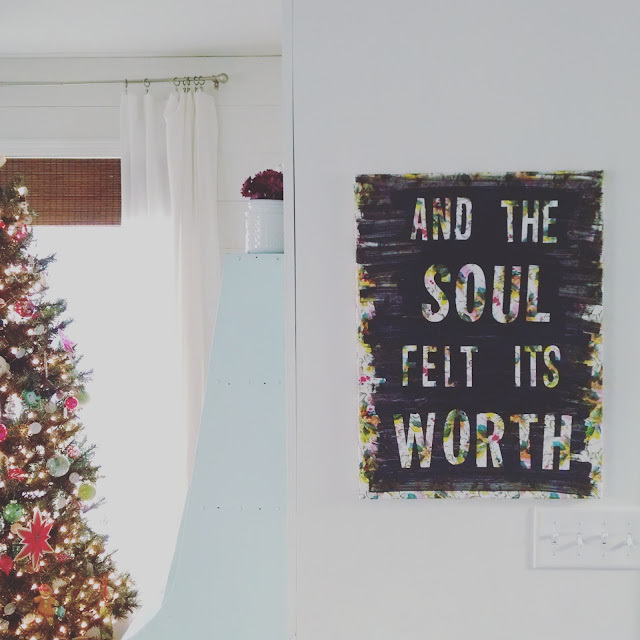 Jesus is the reason for the HOPE and PEACE we have (and is our year round message), but can we just admit that the 'reason for the season' is at least in part because we like all the warm fuzzies that go along with our traditions? I relate with ALL of this. Totally get it. My word! I'm so with you on Christmas and all the confusing feelings. I want to celebrate and give (and get) presents, and then in the same breath, I want to rant at the ridiculous consumerism all around me. It's a confusing dynamic, but it's nice to know I'm not alone. And I love the skinny tree. There are days when I want to fess up about Santa, throw the Elf on a Shelf out the window, and concentrate on the true meaning of Christmas. But then I think about what a scrooge that would make me and why can't the kids just have a bit of fun, etc., etc. So I too wrestle with a balance. 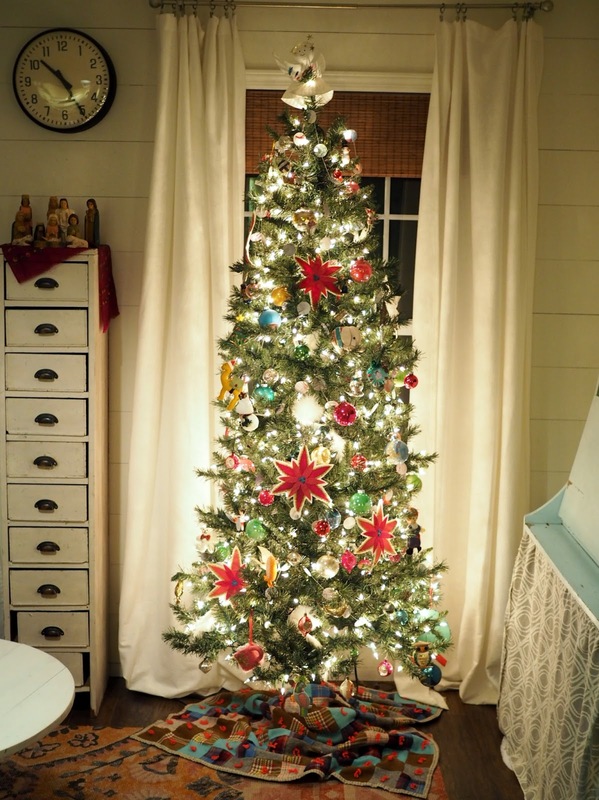 I also have a skinny tree and quilt doing its turn as the tree skirt (love them both). And, by the way, I have never, ever seen anyone use Geez Louise in print (it's one of my favorites). It makes me wonder if you also say Jeezel Pete's, which my husband tells me are the most ridiculous fake swear words he's ever heard anyone say. I loved sitting in your living room all sparkly and warm. Sipping a cup of tea and knowing Emanuel was right there with us. I remember the really tough times as you grew up. Using newspaper for wrapping paper and letting you kids color and paint it, to help convince all of us that this was normal and just a new fun way to celebrate Christmas. And the times loving church members stepped up to the plate and either bought gifts or gave us the best second hand toys they had. But somehow you guys were always thankful and helped me to realize that somehow you "got it", and that helped me to appreciate the wonder of God coming to live with His creation, living right here with us. Our kinsman redeemer doing whatever was needed to be Emanuel. Loved visiting with you here, thanks to Emily's invitation! Someone else who struggles this time of year. I am taking your honesty unknowing into my day, because really. We are all train wrecks in the arms of Jesus. Oh dear, you are so my kinda girl. Love! Your skinny tree looks perfect! Last year I noticed my 4 kids ( 5 and under ) totally were losing the real Christmas story amongst all the commercial. It was sort of like an insignificant side plot in sir little minds. So this year we took a leap away from usual American tradition, and moved gift opening to St.Nicholas' day. We still have a tree, stockings, and paired things waaaay back to one gift per kid. They were all thrilled!! We talked about St.Nicholas and who he was and why He served others. We served others by baking cookies together for our local firemen and delivering them. It was a wonderful day. The emphasis was on giving, not receiving, and we were relaxed. And now we have all the rest of December to do advent scripture readings and really share in the wonder, joy and anticipation of Jesus coming. I can't even tell you how happy this makes me!!! I really love this idea...thanks so much for sharing! 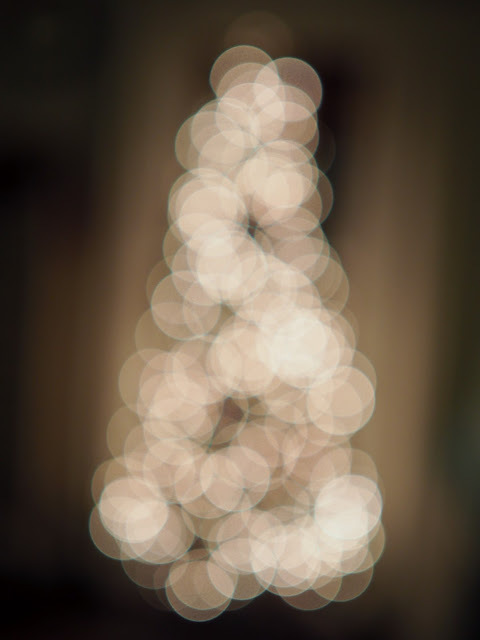 i am whole-heartedly the girl who wants you to post all the snow and garlands and ornaments and light-bokeh. i am christmas-starved always, but especially at christmastime, so just reassure yourself you are doing it in the name of friendship. ps love the skinny-gloried tree. HOW in the name of Holy Water did I miss you were in Holdredge Nebraska. YOU would of been MY perfect Christmas gift. I am sad that you were so close and I was so oblivious. I shall now go find some more green tea add peppermint and close my eyes in selfish sorrow for a bit.